Opal is the product of seasonal rains that drenched dry ground in regions such as Australia’s semi-desert “outback.” The showers soaked deep into ancient underground rock, carrying dissolved silica (a compound of silicon and oxygen) downwards. Opal is known for its unique display of flashing rainbow colors called play-of-color. As the lightwaves travel between the spheres, the waves diffract, or bend. As they bend, they break up into the colors of the rainbow, called spectral colors. Play-of-color is the result. “The Path of Enlightenment” necklace contains 180 magnificent opals from Lightning Ridge, Australia, a famous opal producing area. – Courtesy Cody Opal. Opals are unique – no two opals are the same, even if they originate from the same place. Among the most fascinating, romantic and mysterious gemstones, they are living a great momentum in jewellery, starring in quite a few high-jewellery collections. Here is my personal selection of outstanding opal creations. Tiffany & Co. Blue Book Garnet and Fire Opal bracelet. Designed from an archival sketch, this bracelet of yellow diamonds, fire opals, tourmalines and a center garnet glows in 18k gold. Carat weight: cushion-cut garnet, 12.30. Carat total weight: emerald-cut pink tourmalines, 20.63; fire opals, 12.63; yellow diamonds, 5.12. 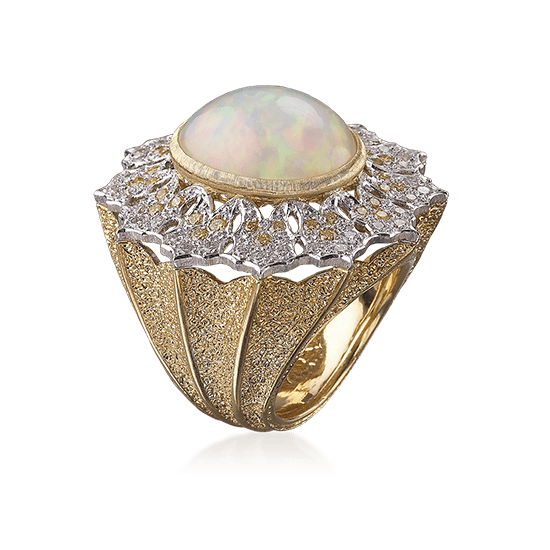 Boucheron’s Indian Palace opal and diamond ring, from the French maison’s Paris Biennale collection, Fleur des Indes, was inspired by coloured pools of water. Tiffany & Co. Black Opal earrings. Earrings of black opals, green tourmalines and aquamarines in platinum. Carat total weight: baguette green tourmalines, 3.72; black opals, 3.56; round aquamarines, 2.94; round green tourmalines, 1.40; oval aquamarines, .85. Chaumet’s Lumieres d’Eau high jewellery necklace, created for the Biennale des Antiquaires in Paris, is set with a 59.58 ct cabochon-cut white opal and opal motifs from Ethiopia, round and oval-cut violet sapphires from Ceylon and Madagascar, oval-cut and brilliant-cut diamonds, and faceted diamond and amethyst beads. Tiffany & Co. Montana Sapphire and Black Opal Butterfly Brooch. An intricate brooch of round brilliant diamonds, round Montana sapphires and carved black opals in platinum. Carat total weight: black opals, 13.13; Montana sapphires, 5.15; diamonds, 4.58. Paula Crevoshay ring in gold, set with a central 5.86ct Brazilian ribbon opal, diamonds and pink diamonds. Superb vintage style. This pear-shaped sapphire has been inlaid into a tulip-shaped opal to create this stunning necklace from Bogh-Art. 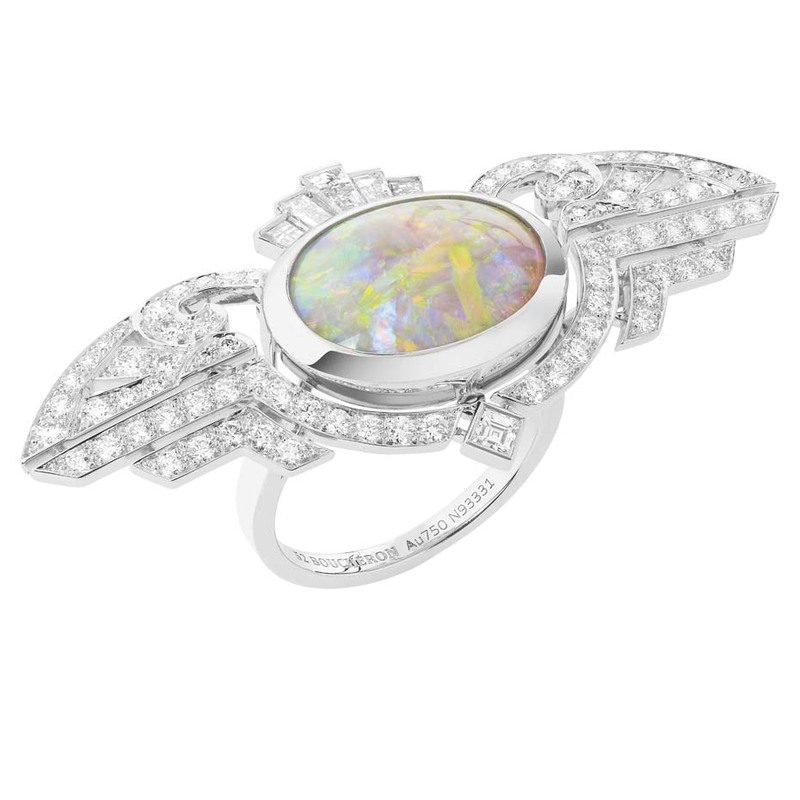 Martin Katz white gold ring featuring a central 13.18ct fire opal cabochon, micro-set with diamonds, tsavorite garnets and orange-red sapphires. High Jewellery Panthère de Cartier Bracelet. White gold, opal, chrysoberyls, emeralds, onyx, brown diamonds, diamonds. Buccellati Pagoda Cocktail Ring in White and yellow gold with Opal, diamonds and fancy yellow diamonds. Material source: The Jewellery Editor, Tiffany & Co., Cartier, Buccellati.